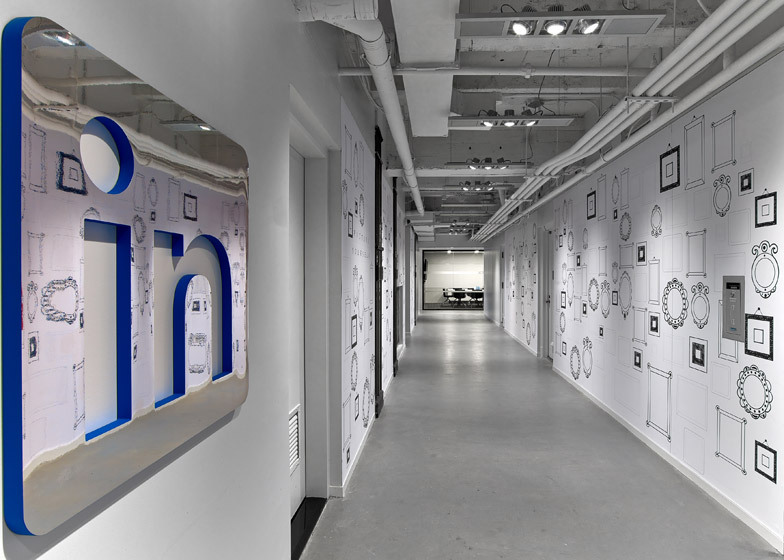 The Empire State Building is already one of the most unique places to work in the city, but the LinkedIn offices on the 28th floor have made the iconic building even cooler. 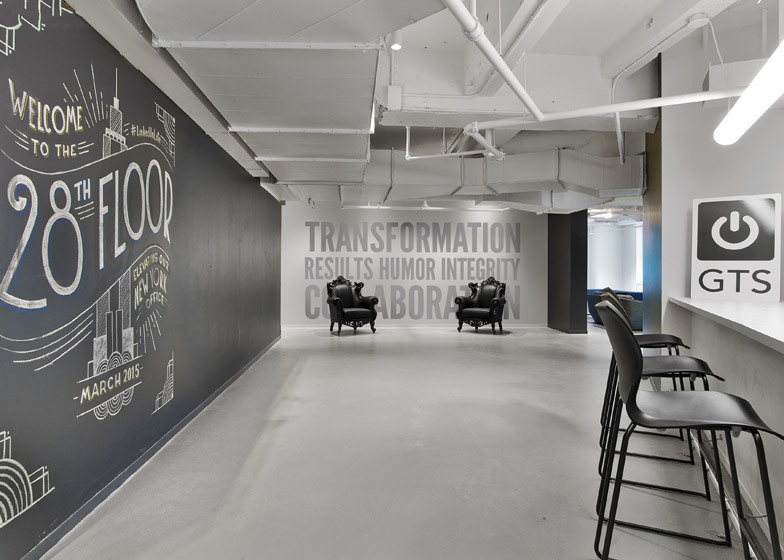 Interior Architects recently remodeled the 33,005-square-foot space, which houses the social network’s sales team. 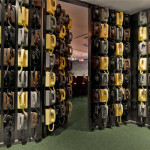 The result is a floor that is “fun and vibrant,” but maintains the professionalism of a “club level of a hotel.” Just a warning, though, everything about this office–from a wall of rotary phones that conceals a speakeasy to a photo display that celebrates employees’ pets–is going to make you pretty bummed about your boring cubicle. 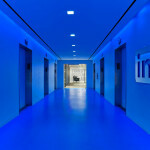 The blue of LinkedIn’s logo is a prominent color in this space. 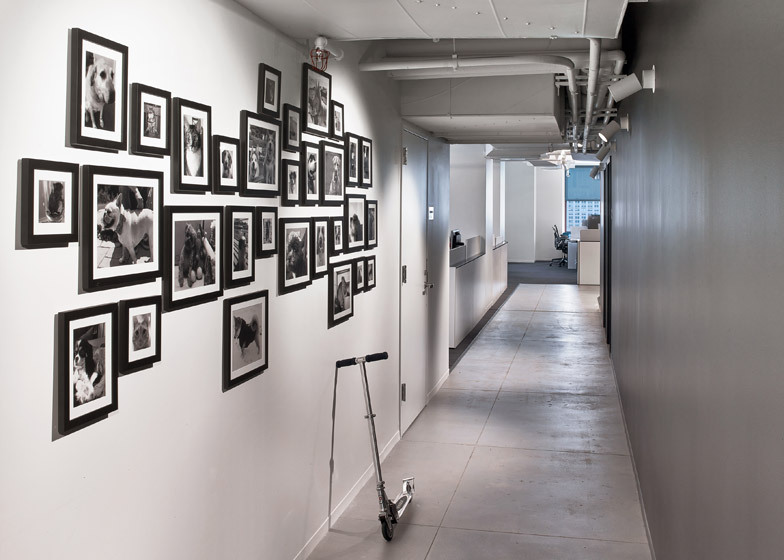 Running along the walls like a ribbon, it ties together the floor’s communal areas. Aside from the streak of blue, most spaces on the floor follow a black, white, and grey color palette; however, these neutral colors combine to create something far different from your typical office digs. 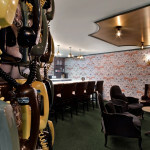 Lively wallpaper and sleek furniture make the lounge seem more like a penthouse than a workplace, while Broadway-style wall art reveals the company’s playful side. 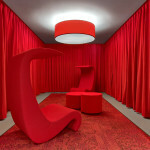 The formal conference rooms balance professionalism and style. 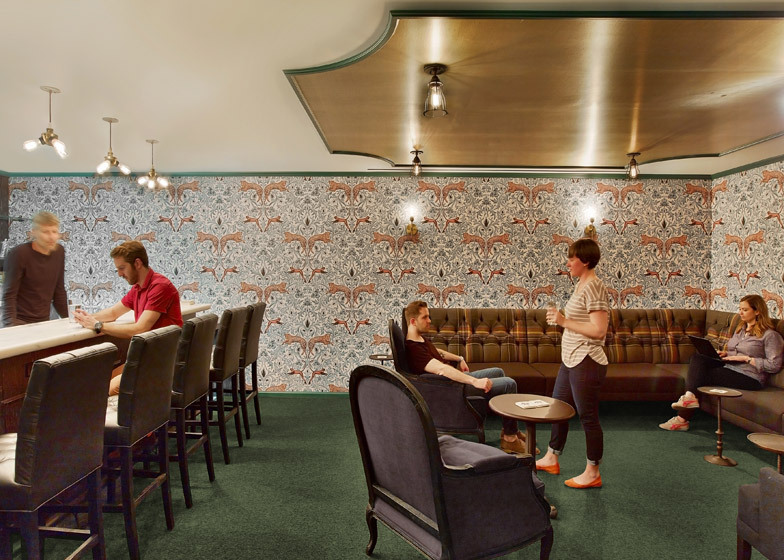 Along with their New York backdrops, these meeting areas are named for obscure streets in the city. 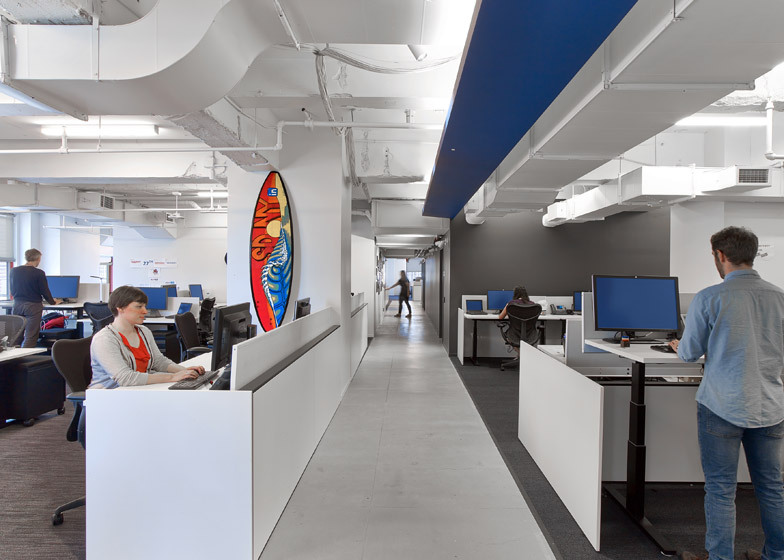 The blue ribbon along the ceiling adds color to the work area, and the work stations are outfitted with height-adjustable desks. 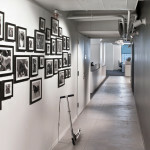 Taking note of the team’s habit of pacing while on the phone, the architects made sure to pay special attention to creating walkways similar to “meandering paths.” The wall of one hallway is decorated with black and white photographs of the team’s pets, while drawings of empty picture frames adorn another hall. 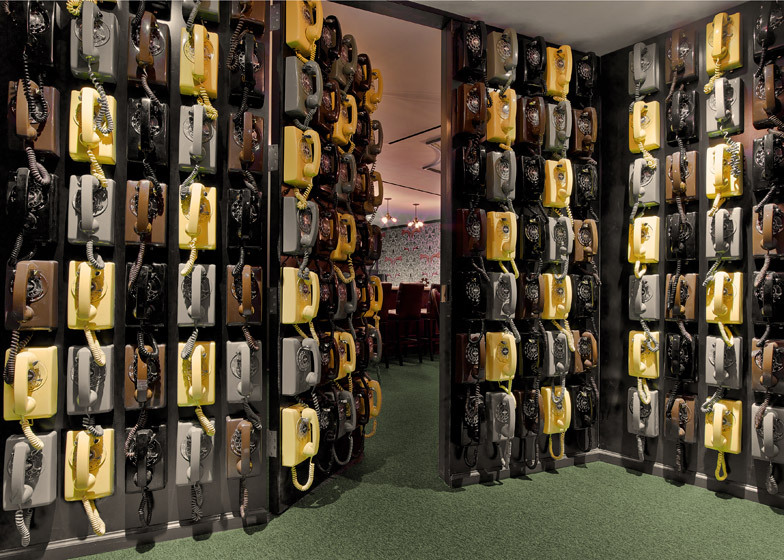 Office amenities include billiard tables and a screening room, but the greatest perk might be the speakeasy hidden behind a wall of 133 rotary phones. 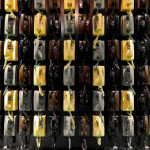 Finding the right phone gives you access to the 1920s-styled room. 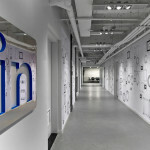 Be sure to click through our gallery below for even more fun shots of LinkedIn’s offices, and check out more work from Interior Architects here.